FORMER Liberal leader Malcolm Turnbull has attacked the Coalition’s direct action policy on climate change, declaring it cannot produce deep emissions cuts without putting a strain on the budget. The opposition communications spokesman, who lost the Liberal Party leadership over his deal with Kevin Rudd to legislate a carbon pollution reduction scheme, told ABC’s Lateline last night the Coalition’s policy on climate change was a short-term one that could be easily stopped. I guess Turnbull wants to see an ETS so he can cash in on the billions to be made trading carbon (allegedly). Enough is enough. I said it when he was dumped as leader & now as well. get rid of him, he’s a banker who has lost a lot of money on carbon credits & needs to swindle his money back!!!!! He is nothing but trouble!! Holding up the UK government as an example to follow should be an instant sackable offence. 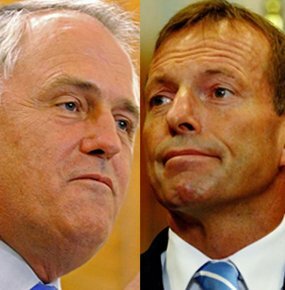 Abbott needs to pull Turnbull into line, and quickly. He needs to stamp leadership on the party. If he wants a frontbench position he should stop talking up carbon pricing. Sack Turnbull now! He certainly should never have been on Abbot’s front bench. Pathological egomania seems to prevent him displaying even the most basic loyalty to his party. That after so many previous episodes the ABC continues to be able to exploit this disloyalty in fomenting disunity within conservative ranks surely must now make it abundantly clear to Abbot that Turnbull has to go. Don’t worry about Malcolm, he only supports the CO2 taxes and the ETS to look after his banking mates at Goldman Sachs. Turnbull’s indignant attitude expressed rit large at the budget reply by Abbott showed me he is still a childish sook! People should never forget that he was politically dead anyway as Rudd plotted to get him out over “Ute Gate” so in fact the Liberals did him a favour by replacing him earlier.Turnbull should be thankful, he should have really resigned altogether after that pathetic “dummy spit”! Now, if only we could get Martin Ferguson to speak out against the Govt’s plan we would have a quisling on both sides. It never ceases to amaze me that so many people have such a guilt complex when it comes to the environment that they WANT to believe that mankind is responsible. These people never seem to actually look at the science. At the very least they will accept the nonsense that is peddled as fact without considering that there are 2 sides to the issue. I have also read some comments that people have made in the papers / blogs etc that as now European union are taxing carbon that its a good reason that we should do something. These same people are probably unaware that Canda just had an election where the Green coalition campaigning on a platform of implementing a carbon tax was defeated and delivered the 1st majorty government in 20 years. I recently heard someone say on the ABC that we need more “failed” politicians I.e. ministers who stick by their principles and are willing to steer the course with all the risks that go with it. MT is such a politician who continues to deliver what he believes to be the right when it comes to the government’s response to Climate Change. Tony Abbott’s “crap approach will ultimately fail him, if not in this term than certainly in the next. “It’s a big tax!” … for Goldman Sachs.